Lawyers for the Covington Catholic High School student who was demonized by the media are making preparations to potentially sue celebrities, media entities, politicians, and others for libel and defamation. Lawyers sent out more than 50 letters instructing potential defendants not to destroy evidence. 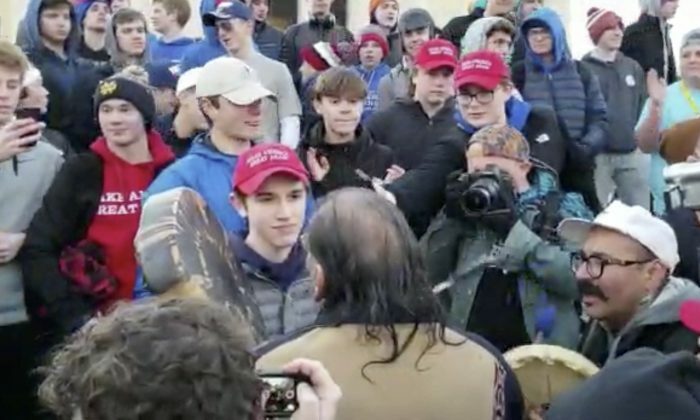 Nick Sandmann, the 16-year-old seen in the viral video standing in front of a Native American man playing a drum, was trashed by prominent figures like actor Jim Carey, actress Alyssa Milano, Senator Elizabeth Warren; media organizations like the New York Times and the Washington Post; and many others in a mob-like fashion. After a longer video emerged with more context, many that were initially against Sandmann issued apologies, retractions, or simply deleted tweets. The extended video showed how the Covington Catholic High School students were being harassed by a group of Black Hebrew Israelites before the Native American group stepped toward the students while playing drums and singing. The image was initially interpreted by the media as a racial confrontation, with the white high school students as the aggressors. Sandmann’s legal team includes L. Lin Wood, an attorney nationally recognized in the field of libel, defamation, and the first amendment. The legal team released a 15-minute video to clarify what happened that day, after the March for Life in Washington, on Jan. 18. The 15-minute video paints a picture with much more context than the short viral video clip that led to the initial outrage. It shows how the Indigenous Peoples March took place at the same time at the anti-abortion March for Life. The video shows Black Hebrew Israelites spewing racial slurs at Native Americans seemingly there to attend the march. They are doing much the same thing that they did to the Covington High School students who were waiting for their bus after the march, near the Lincoln Memorial. The video shows the Hebrew Israelites also throwing out racial slurs and using abusive language towards other black people passing by. A few of the high schoolers wander over, and are met with racial abuse, irregardless of the age difference between the Hebrew Israelite men and the Covington high school boys. Fox News asked lawyer David Gibbs of the National Center for Life & Liberty what he thinks of the viability of the lawsuit. “I think we need to recognize that reputations should not just be disposable by journalists in this internet era. In this case you don’t have the president, or the Speaker of the House, or a public figure, you have teenagers,” said Gibbs. “But when you look at an ongoing defamation where false statements are being made, where they’re being labeled as terrorists or trouble-makers in this internet era, that’s a branding that the journalists should be held responsible for. Gibbs had more words about the journalists who reported falsely about Sandmann.